Glen Miller is the most popular and largest of Richmond's parks. It spans 194 acres. The park is located on Richmond's east side, at 2200 East Main Street. Glen Miller Park is also home to the Parks Administrative Office, which is located next to the playground. Your Next EventGlen Miller Park is the perfect location to have a party, birthday, or any other event. Look through the Shelter Rentals to find the right location for you. 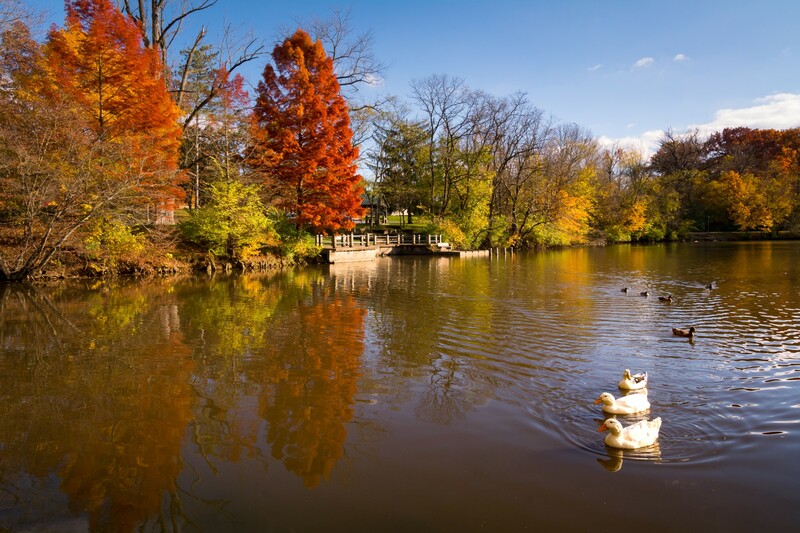 Glen Miller Park was established in 1885 and was named for Colonel John Ford Miller who was a railroad executive during the late 1860’s. Colonel Miller bought the land from Nathaniel Hawkins in 1880, with the intention of transforming the land into a park. After five years, Colonel Miller sold the land to the City of Richmond. On June 6, 1885, the park was opened to the public. One of the qualities of the park that drew Colonel Miller to the land, and is still bringing people here today, is the freshwater springs. Before selling the land to the city of Richmond, Colonel Miller had city health officer Dr. T. Henry Davis test the water of the springs within Glen Miller. It was found that the springs contained high levels of iron, something that they then believed added to the health benefits of the water. People still fill water jugs at the springs in Glen Miller Park and believe that the water found here does benefit their health. In 1890, Glen Miller Park opened a zoo. The Glen Miller Park Zoo was one of the most popular in the region, and brought many people from outside of Richmond to the park. The size of the zoo was increased in 1908, and in 1964 the park boasted 250 different birds and animals. Unfortunately over many years the zoo began to decline, ultimately being listed on the Parade magazine’s list of 10 worst zoos in the country in 1984. The last animals were removed and the zoo closed just two years later in 1986. The Madonna of the Trail Monument was built at the entrance of Glen Miller Park in 1928. One of only twelve statues erected by the Daughters of the American Revolution along U.S. Highway 40, it was dedicated to the spirit of pioneer women in the United States. It was commissioned to project a representation of the courage and faith of the women whose strength and love relieved so swiftly in conquering the wilderness and establishing permanent homes. The Madonna of the Trail Monument was restored and rededicated in 1988, along with the other 11 monuments. In the summer of 2003, Glen Miller Park hosted a celebration to commemorate the 75thanniversary of the Madonna of the Trail Monument, where it was rededicated for a second time. The most recent restoration of the statue took place in 2005. Another important fixture of Glen Miller Park is The Richmond Rose Garden. In the early 1970s, Richmond began to call itself the Rose City, due to the presence of three companies that were known as premier growers and marketers of cut roses both domestically and internationally: E.G. Hill Company, Joseph Hill Company, and Hill Floral Products Company. The city wanted to restore the E.G. Hill rose garden, which had been started in 1937 by the Hill companies, as well as develop a larger rose garden, like those in other rose cities. After trips to Zweibruken, Germany and the formation of the Rose Garden project committee in 1985, plans to build the Richmond Rose Garden were developed. In 1987, the rose garden was dedicated and opened to the public. After just two seasons of being open, the Richmond Rose Garden was designated an All America Rose Display Garden by the All America Rose Selection Board (A.A.R.S.). The Richmond Rose Garden shares this distinction with only one other garden in the state, and is one of only 130 public display gardens nationwide. The newest portion of the Richmond Rose Garden is the Richmond-Friendship garden that commemorates the friendship between Richmond, Indiana and Zweibruken, Germany. The garden holds many German rose varieties as well as a rose statue that symbolizes the friendship between the two cities. In addition to a great history of natural beauty, Glen Miller Park has been home to two military monuments, commemorating Richmond citizens who have served our country, both past and present. Each monument has an interesting link to history, not only because of the people they commemorate, but also the materials used to build the monuments. Near the park office is a monument to honor the United States Marines. Dedicated in 1977, the stone that was used to create the monument was stone from the old city hall in Richmond. The second monument honored the deaths of three Richmond men during the Spanish American War. Perhaps the most interesting detail about the monument, which was placed in the park in 1929, is that the plaque contains metal salvaged from the battleship USS Maine. The monument has recently been moved to Veterans Memorial Park. Glen Miller Park is host to many entertainment and cultural activities throughout the year and historically hosted an event called Chautauqua. From 1903 to 1923, Chautauqua was an annual event in Glen Miller Park. The event had musical and educational programs throughout its duration, and was held over several days. Temporary tents were set up within Glen Miller Park to hold the different programs. Visitors camped in Glen Miller for Chautauqua, with an estimated 1,000 people camping out during the event each year. Headliners for Chautauqua included William Jennings Bryan, Booker T. Washington, and Billy Sunday. The event offered amenities such as tent rentals (for an additional fee you could rent a floor for your tent too), dining, electric lighting, spring water, mail delivery, and telephones. Chautauquas took place in other cities as well, and speakers and entertainers would move from location to location along the Chautauqua circuit. It was often the only opportunity for culture and entertainment in small towns in the United States during that time period. The Chautauqua Institution, the inspiration for the Chautauqua that occurred in Richmond still exists today beside Chautauqua Lake in New York state. Glen Miller Park has been a staple in the Richmond community for more than 100 years, and we hope it will continue to be enjoyed by the public for many more years to come. Please enjoy these additional historical images of Glen Miller Park.